The 1950s saw the infiltration of household appliances in homes across America. Today, it’s almost impossible to find a home without a cordless handheld vacuum cleaner, dishwasher, washing machine, or some other form of a cleaning appliance. The fact is that they make life much easier and allow the modern busy family to complete regular household cleaning tasks in record time. Every year, household appliances, just like other electronics, go through certain upgrades. That leaves the average homeowner wondering what they should add or if what they have at home is all that they’ll ever need to get their cleaning done. Here are the top 5 home appliances for cleaning that every homeowner should buy. 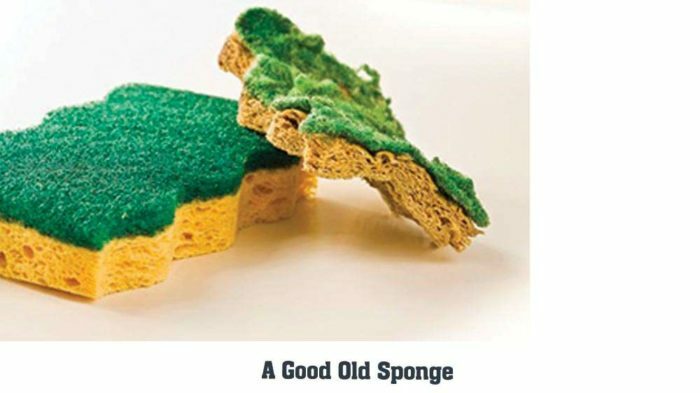 It might sound basic but a sponge is amongst the most resourceful cleaning tools you could have at home. There are varieties of them around with each suited to perform diverse cleaning tasks. For instance, there are sponges with an abrasive side that can tackle grimy surfaces, the spaghetti sponges that don’t require soap when using, and the silicone kinds that come built to last almost forever. The most common sponges that you’ll come across are cellulose-made. They provide good absorbency and they are also very inexpensive. They are also used for a wide range of cleaning tasks and they can last through the toughest of chores. Going back to the abrasive sponges you’ll typically come across two varieties. One comes with an abrasive side attached to a regular cellulose sponge. There is another kind of an abrasive sponge that features just a thin abrasive material and doesn’t come with the cellulose. Most of them also come color-coded in relation to their toughness, but each company that manufactures them has their own individual color coding system. Most homes have either hardwood or tile floors with a few having carpeted surfaces. In both cases, dust and other debris can create an unsightly mess. 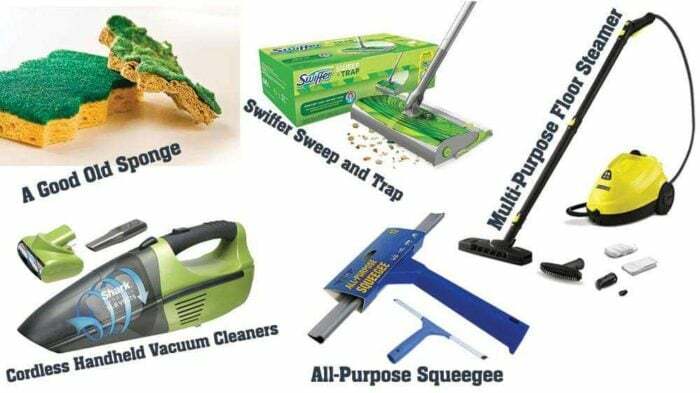 That creates a need for a lot of sweeping and mopping which a handheld broom and dustpan set, Swiffer Sweep and Trap, or spray mop can effectively handle. The handheld broom and dustpan set are also one of the staples in most households. It comes in handy when you want to clean up crumbs or other solid-based messes. The obvious limitation is that it doesn’t quite pick up everything, and it can miss hard-to-reach places. 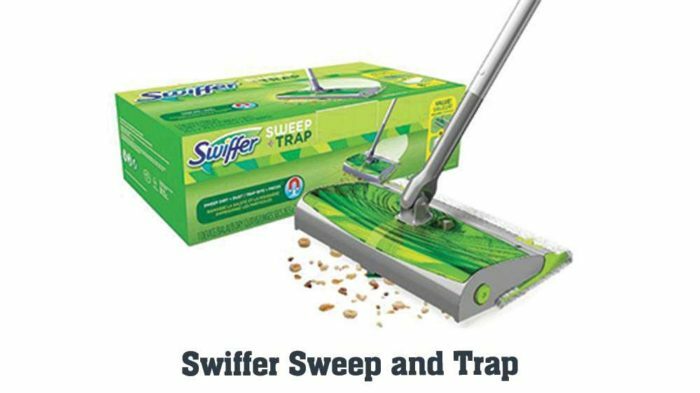 The Swiffer Sweep and Trap pick up just about every dirt that’s on the floor including dog hairs, dust, and food crumbs in a single quick sweep. It’s a handy solution when you want something much like a vacuum cleaner. It does come at a fraction of the cost and also operates silently. The only demerit about it is the fact that it requires disposable dust cloths making it expensive in the long run. The handy spray mops come with provisions to accommodate cleaning solutions. As implied, they spray out the solution when mopping through floors and also have microfiber cleaning pads. They are also suitable for switching between hardwood and tile floors seamlessly. Most of these mops also come with a long handle which also takes away the arduous task of having to bend while doing the cleaning. The long handle also makes it the perfect solution to reach underneath furniture and cabinetry when cleaning. After taking a shower, you’ll have some pools of water on the floor and splashed on the bathroom walls as well as soap scum. 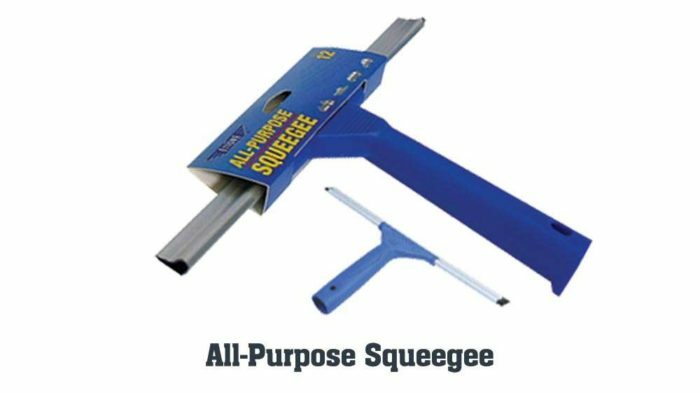 An all-purpose squeegee is a versatile tool you need to wipe off the excess water and leave the bathroom clean. It also prevents soap scum build ups on the walls, floor, and shower door which can become harder to clean later. It’s also good practice to squeegee the walls and floor after showers to keep them mold-free. The bathroom mirror also gets a fair share of splashes and smudges from activities like brushing your teeth or combing out your hair. A squeegee can also help clean up the mirror effortlessly. The same applies to windows all around the house; the squeegee comes to the rescue. The right one can work on both rippled and smooth surfaces while featuring a soft handle providing a firm grip. Also, remember that you might have to replace the rubber blade when you notice worn out corners, the rubber rounding or abrasions. The rubbers are also relatively inexpensive which doesn’t give you a reason not to replace them. You also want to get one with a long-enough handle depending on your intended use. If you want to use it primarily for cleaning high-placed windows, then you undoubtedly want one with a long handle or one that comes with attachments that allow you to perform different tasks. You’ll mostly spot these being used by commercial cleaners, but there are quite a few good ones that can serve the average household. They are also a great trade-up from the traditional squeeze or string mops and bucket cleaners. A good one can work perfectly on stone, wood, and tile floors with the added benefit of freshening carpets. The way these cleaners work is that they come with an integrated water reservoir. 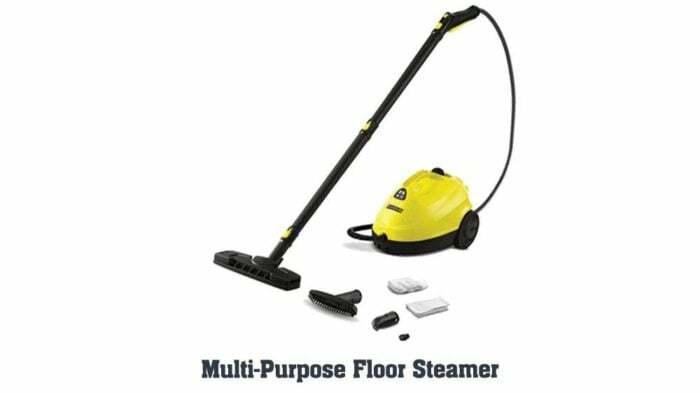 When in use the generated steam helps to clean and sanitize floors meaning no dripping or sloshing that is characteristic of other cleaning methods. Most home floor steamers come in the form of mops with washable microfiber pads. However, some might feature advanced designs with features like detachable steamers, swivel heads to maneuver through corners or under cabinets while cleaning, and additional cleaning attachments. Floor steamers are also best used in houses with sealed floors to avoid leaving moisture behind that can destroy what’s underfoot in the long run. While there are specific floor steamers designed to work on hardwood floors, most generally they aren’t, and manufacturers can void the product warranty if used on such floors. The vacuum cleaner could be considered the golden standard of household cleaning appliances. It gives your floors a more thorough sweep, and it can be a good occasional cleaner in collaboration with any of the other appliances listed above. However, more homeowners are choosing the cordless handheld vacuum cleaners rather than the traditional bulky ones. There are some which can even end up functioning as your one and only vacuum cleaner. The reason why you want to choose a cordless vacuum cleaner for laminate floors is the flexibility of being able to move with it. You can use it in different areas or rooms without having to plug and unplug it. They are also the best option to use on stairs and cars when compared to the traditionally corded vacuums. Best of all, they are lighter than the corded vacuums making them easier to handle and comfortable for longer cleaning tasks. The standard vacuum might or might not come with an extendable hose and nozzle or attachments to get to hard-to-reach places. Two-in-one varieties come with a detachable handle that you can use to get to such areas. The handheld cordless vacuum cleaners might not pack as much of a punch as the others, but they work effectively in cleaning areas around the home and the inside of your car. Now the cordless vacuums rely on batteries to operate and the first thing you want to check is their battery life. Some might give you less than 10 minutes of battery life per use, but it’s possible to find some that offer an hour or more. 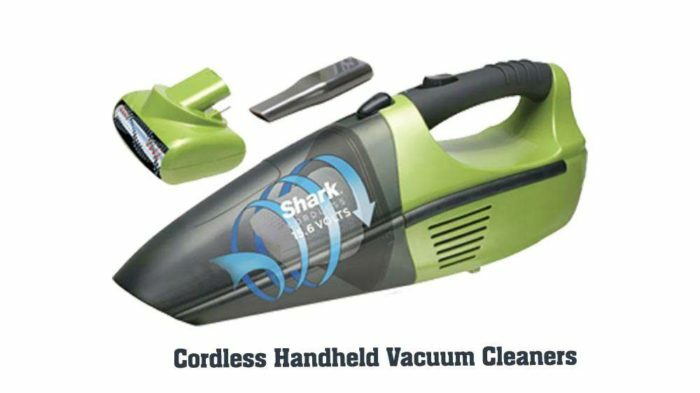 You’ll also need to charge the handheld vacuum and the charging time varies from one product to the next. Another important feature to consider when getting a cordless handheld vacuum is its capacity. Since they are smaller in design, it also means that they come with a significantly smaller capacity and that also means having to empty them more often. You can still find one with a decent enough capacity that won’t inconvenience you too much. There is also the matter about whether it’s bagless of a bagged model, and in the case of the bagged models try to look for one that comes with a reusable bag. You also want a vacuum that comes with additional attachments that make cleaning more comfortable. For instance, some come with attachments for cleaning walls, upholstery, and even carpets. To sum it up, with these five essential household cleaning appliances at home you can be sure to get your cleaning done effortlessly and in record time. When buying any of these cleaning tools, be sure to have your household’s changing needs in mind and invest in products that you can use for long. The cordless handheld vacuum comes highly recommended as one of the must-haves you want to have at home.